Service missions provide meaningful experiences that will help bring souls closer to Christ. Service missions bless the missionaries, their families, the Church, and the organizations where they serve. Each service mission is uniquely designed to match the abilities of the individual and to help build the kingdom of God on the earth. A service missionary handbook is given to every service missionary who is called. The handbook gives counsel and guidance about topics such as commitment to serving the Lord, personal conduct, and daily schedule. Before beginning the service mission, missionaries should carefully review the handbook with their parents and stake president. How can bishops and stake presidents prepare parents and candidates to receive a service missionary assignment? Each mission call and assignment, or a later reassignment, is the result of revelation through the Lord’s servants. A call to the work as either a proselyting or service missionary comes from God through the President of the Church. The spiritual gifts of prophecy and revelation attend all mission calls and assignments. How can local leaders help their members understand the importance of a service mission? Remember that there are no disabilities or handicaps in the eyes of the Lord. Each of Heavenly Father’s children is blessed with unique spiritual gifts. Choose their words carefully when speaking to members and parents about service missions. They set the standard in the way mission calls and experiences are perceived. Emphasize that both proselyting missions and service missions are acceptable offerings to the Lord, and should avoid using the terms “real mission,” “normal mission,” or “traditional mission” when referring to a proselyting mission. Teach that all missionaries represent the Lord and are His agents in the work of salvation. What is the missionary recommendation process? All young men and young women who have a desire to serve a mission and are worthy to do so fill out an online recommendation that is processed by the stake president. Based on the information contained in the application, including the evaluation of the bishop, the stake president, and medical professionals, a service missionary assignment may be made. The Quorum of the Twelve and General Authority Seventies oversee the mission recommendation process, and the missionary call is issued from the Lord through His prophet. Can a missionary candidate choose either a proselyting mission or a service mission? A missionary candidate does not choose which kind of mission he or she will serve. All applicants are considered first for proselyting missions. 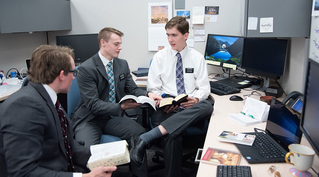 Young men and women who are unable to be called as proselyting missionaries for physical, mental, or emotional reasons are called as service missionaries. If an applicant is called as a service missionary, the applicant's service is tailored to his or her unique talents, skills, and gifts and to the local environment. What are the types of service missionary assignments? Service missionaries serve at approved community charitable organizations (such as food banks, refugee services, or shelters), Church operations (such as storehouses, canneries, temples, seminaries and institutes), or in assignments from their stake president or bishop. JustServe.org may be a helpful resource for identifying charitable service opportunities. Service missionaries living in remote locations may need to rely more heavily on a variety of community charitable organizations and stake-assigned service, such as hospitals and local service activities. How is a service assignment created? After a young man or young woman has been called to serve as a service missionary, the stake president counsels with the missionary, his or her parents, and the service mission leaders to create a customized mission to match the missionary’s capabilities. Under the direction of the stake president and with the recommendation of the service mission leaders, assignments may be adjusted during the course of the mission. Where do service missionaries live? Service missionaries live at home and serve locally. In some rare cases, service missionaries may receive permission to serve away from home while living with relatives. Specific arrangements should be made in counsel with the stake president, the missionary's parents, and the Service Mission Office. If the service missionary lives with relatives in a different stake, the membership records are transferred, and the relatives’ stake president assumes ecclesiastical responsibility for the service missionary. In no circumstance do service missionaries live alone. When do service missionaries wear their name badges? Service missionaries always wear the service missionary name badge at their service assignment, during service mission meetings, and at Sunday Church meetings. They do not wear the name badge at other times. No. Dating is not permitted for service missionaries during their missions. Service missionaries can participate in ward, stake, and young single adult activities. Who pays for a service mission? Service missionaries and their families are responsible for the expenses related to their missionary service. These expenses include but are not limited to transportation, food, clothing, medical, dental, and auto insurance. Service missionaries are responsible for transportation to and from their service locations. Service missionaries receive no financial support from the General Missionary Fund. Do service missionaries have companions? Although service missionaries do not have companions like proselyting missionaries do, their safety and well-being are paramount. The stake president and parents ensure that there is appropriate support, supervision, and protection during the service missionary’s daily service schedule. Where applicable, service mission leaders may create companionships for missionaries while serving at the same location or for purposes of gospel study and special service activities. Are service missionaries given leadership opportunities during their service missions? Service mission leaders provide appropriate leadership development opportunities, if possible, to missionaries as a part of their mission experience. Is a service mission recorded on a membership record? Yes. It is recorded the same way as a proselyting mission. Who can honorably excuse a young woman or man from missionary service? A stake president may honorably excuse any young man or young woman who he is confident is incapable of serving either a proselyting or a service mission. However, a stake president does not determine whether an applicant is called to a proselyting mission or a service mission. Stake presidents continue to provide input in the online recommendation form for young adult men or women to be called as either proselyting missionaries or service missionaries. Do young men need to hold the Melchizedek Priesthood? No. However, most male service missionaries hold the Melchizedek Priesthood. If priesthood leaders do not feel that a young man is ready to hold the Melchizedek Priesthood, he should hold the Aaronic Priesthood. Do service missionaries receive their endowment? Service missionaries must be temple worthy. In general, service missionaries should receive their endowment. However, bishops and stake presidents offer counsel to service missionaries to determine if they are ready and capable to receive the endowment. Who is the mission president for a service missionary? The stake president continues to be the ecclesiastical leader for the service missionary. Where service mission leaders have been called, they offer support and training experiences for the missionary, but they do not replace the stake president. How are belated confessions and serious transgressions by a service missionary handled? The stake president responds to belated confessions and serious transgressions as directed by the Holy Ghost, as he would with any member of his stake. If he is unclear about what to do, he may confer with his counselors, the Area Seventy who chairs his coordinating council, or a member of the Area Presidency. If the repentance process can be completed during continued service as a service missionary, the service missionary may continue his or her service mission. If formal Church discipline is administered, the service missionary should be released, and the Service Mission Office at Church headquarters should be notified. If a service mission leader or an external operations manager is made aware of a belated confession or any transgression, the service missionary should be immediately directed to his or her stake president. A service missionary who is released before completing the service mission for worthiness reasons is generally not reinstated. In rare circumstances, individuals who desire to be reinstated as a service missionary after being released early for worthiness reasons should work through their stake president. If the stake president feels that an exception should be considered, he may submit a request to the Missionary Department. These reinstatement requests are reviewed by General Authorities assigned to the Missionary Department. May a service missionary be reassigned to become a proselyting missionary? After being assigned to a service mission, a service missionary is, in general, not reassigned to become a proselyting missionary. If the circumstances that precluded service as a proselyting missionary are substantially and materially altered, reconsideration may be requested through the Missionary Department. What are the safety and risk considerations for service missionaries? Service missions are acceptable offerings to the Lord when a proselyting mission is not possible. Therefore, terms such as “real mission,” “normal mission,” or “traditional mission” when referring to a proselyting mission are to be avoided. All missionaries represent the Lord and are His agents in the work of salvation. May a service mission be extended beyond 24 months (young men) or 18 months (young women)? No. The service missionary should transition into employment or post–high school training or education. May an early-returned missionary be called to serve for a term other than 6, 12, or 18 months? Yes. The missionary may be reassigned to serve for a period sufficient to complete the balance of 18 or 24 months of service. Where can I find more information for an early-returned missionary? Please see the Early-Return Reassignment section of the Customized Experience page. Is a rehabilitating missionary eligible for a service mission? A proselyting missionary who returns home for an extensive period of rehabilitation but plans to return to his or her proselyting mission is not eligible. While the missionary may serve as a volunteer during this period, and the local service mission leader may assist in finding service opportunities, the rehabilitating missionary is not a service missionary. However, he or she may participate with service missionaries in appropriate activities, if desired. Do early-returned missionaries need to be set apart as service missionaries? If a proselyting missionary returns from his or her mission early and is called to a service mission, he or she need not be set apart again. However, the stake president is encouraged to provide a priesthood blessing of comfort and counsel. How does a service mission align with the recent emphasis on ministering? A key component of service missions focuses on providing service missionaries with ministering opportunities. In addition, service missionaries may continue to have ministering assignments within their ward under the direction of local priesthood and Relief Society leadership. Service missionaries may, on occasion, proselytize and teach with proselyting missionaries as members, but they should not wear their name badge. What happens when a service missionary is called and released? Service missionaries speak in sacrament meeting before and after their missions, receive the same recognition as proselyting missionaries (mission plaques, bulletins, newsletters, and so on), and report to the high council upon completion of their missions. Are these materials available in other languages? These materials are currently provided only in English. However, there are plans to offer them in multiple languages early in 2019. Service missions complement proselyting missions by allowing others to experience God’s love through receiving Christlike service. Now more than ever, young women and men who have a desire to serve will be given the opportunity to further the work of the Lord as a missionary. This will be a great blessing to the missionaries, to their families, and to those they serve.